I made this chili for the second time tonight. The first time, I thoughtlessly naively used smoked chipotle chili powder instead of milder, Ancho chili powder. And almost killed my family on Christmas Eve. WIth their permission, I tried again. Without any chipotles. They declared this chili “best ever.” (edited to explain the reference to velvet. That’s the texture of this chili – absolutely velvety. I’ve never had chili so soft and delicious). If you want more heat, add more green chili or try some smoked chipotle chili powder, just not a 1/4 cup. I’ve written this for my cast iron Dutch oven by Lodge. You could use a slow-cooker too. Use beef that is no leaner than 85 percent. Otherwise, the texture will become dry. 1. Heat the oil in a fry-pan or a Dutch oven. Add onions, garlic, chili powder, tomato paste, cumin, pepper flakes, and 1/4 teaspoon salt and cook about 10 minutes, stirring often. 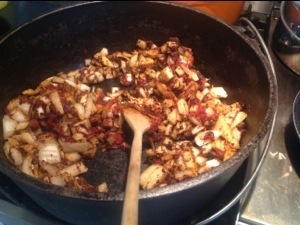 Stir in the diced tomatoes with their juice, scraping up any browned pieces. 2. (If you are using a slow-cooker, Transfer the mixture into the slow cooker.) Add tomato puree, coconut aminos, oregano and pepper. Stir really well. This is your last chance! Add the raw ground beef to the pot and stir it gently. Cover and cook. Regular oven: 125 C for 5 to 6 hours. Slow cooker, either on low or high, 8 to 9 hours on low or 5 to 6 hours on high. 3. Let the chili settle for 5 minutes, then gently tilt the Dutch Oven or slow cooker. Skim off the fat with a large spoon. Season with salt and pepper to taste and serve with the lime wedges. We also enjoyed avocado, lettuce, and tomatoes with this. 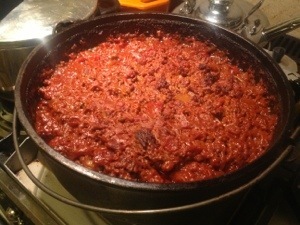 Posted in Recipes and tagged Dutch oven, family favorite, paleo, protein, slow-cooker. Bookmark the permalink.